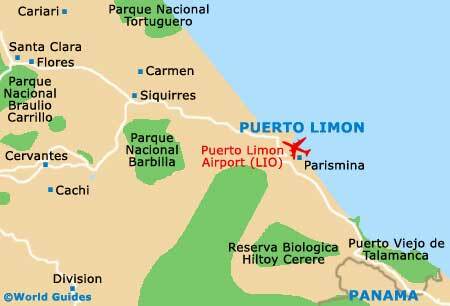 Most restaurants in the south of Puerto Limon are found around and back from the beach areas, where they serve both the distinctive local cuisine, and Italian and Asian foods. Upscale dining options are mostly located in the spa hotels and beach resorts, and there are some interesting restaurants based along the Puerto Limon Boulevard - the wide pedestrianised street leading down to the harbour. For a more comprehensive choice of dining establishments, Puerto Viejo is just along the coast and well-known for its American community and its diverse selection of eateries, bars and nightlife. International cuisine and even fast-food joints can be found here, as well as some great seafood eateries. Unlike the rest of Costa Rica, Puerto Limon's population of around 90,000 people is mainly of Afro-Caribbean stock, giving a Caribbean Rastafarian flavour to the local cuisine. From the local restaurants to the food vendors in the city's markets, seafood is the most popular ingredient, whether it is fish or Caribbean crustaceans, such as lobster. Prices are, in the main, reasonable and for those on a budget, eating out at a market food stall is a delicious and inexpensive dining experience. 'Casado' - a mix of rice, beans, meat, plantain and cabbage, is a favourite lunchtime dish served in most 'sodas' (small local eateries), as is 'gallo pinto' - seasoned rice, beans, soured cream and a tortilla. 'Picadillo', another popular dining choice in Puerto Limon, is a delicious meat and vegetable stew. Chicken, seafood and other meats are prepared with Afro-Caribbean spices and served grilled or barbecued with fresh salads, and coconut milk is a main ingredient in many restaurant dishes in Puerto Limon, especially those involving chicken. Jerk spices are used frequently, together with cinnamon, nutmeg and ginger. More information about San Jose restaurants and dining.